An award-winner! August Moon is a robust grower that produces large, uniformly crinkled, yellow-green leaves. The foliage holds its color all season and can grow in full sun as well as deep shade. 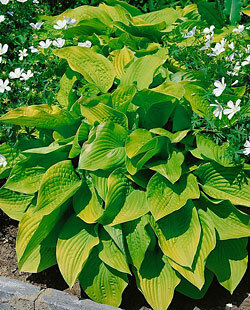 Unique coloring and lush growth make them wonderful for combining with other hostas, fantastic for bordering walks or drives, or filling in a shady corner of the yard where few plants will grow well.